For the next several weeks, we’re going to talk about buildings and places in the community. All cities and towns in the United States have some of these places. This week, we’re going to talk about government buildings and what happens there. Every city and town needs a place for the local government workers to work. A city hall or town hall might contain offices for the mayor (the head of government in a city or town) and other government officials, and it may have a space where the city or town council can meet. This council is a group of people who make decisions for a community. They decide which projects are the most important. These projects could be parks, playgrounds, sidewalks, new buildings, libraries, garbage collection, street lights, or many other things. A large city or town hall could have an auditorium where members of the community can come for meetings. At these meetings, community members can talk about problems in their neighborhoods or projects they want to do to improve their community. A municipal building is similar to a town hall, but it probably does not have an auditorium for town meetings. It probably only has offices and rooms for small groups, like the town council, to meet. 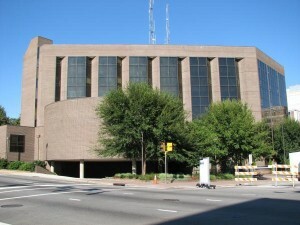 Raleigh’s municipal building is called the Avery C. Upchurch Government Complex. It holds offices for city government administration, and Raleigh’s city council meets there. The building was named after a former mayor of Raleigh. It is located on Hargett Street in downtown Raleigh. you take legal action against someone (or someone takes legal action against you). you want to get married. you want to get divorced. you want to adopt a child. you want to register a business. you are called to jury duty. you get a traffic ticket. Judges and some kinds of lawyers have offices at the courthouse. Because Raleigh is the capital city of North Carolina, it has state government buildings in addition to city and county government buildings. The NC Capitol is located in downtown Raleigh. Many years ago, North Carolina’s General Assembly (law-makers) met in this building. Now, the governor, Pat McCrory, and lieutenant governor, Dan Forest, have their offices here. A governor is the head official of a state. A lieutenant governor is the person who will become the governor if the governor dies or cannot continue in his/her office. The United States has a president and a vice president. North Carolina has a governor and a lieutenant governor. As the population of NC grew, we needed more representatives in our state government. We needed more people to represent us, more people to make laws for us. These people make up the General Assembly. They used to have their meetings in the Capitol Building, but now there are too many of them for that space, so they meet in the Legislative Building, which is also in downtown Raleigh. Can you answer these questions from this post? What is the difference between a town hall and a municipal building? What is a city council? What does it do? Where does Raleigh’s city council meet? Name three reasons you might go to the county courthouse. Name two state government buildings. Where does the NC General Assembly meet? Who is Pat McCrory, and where is his office? Who is NC’s lieutenant governor? Where is the NC Legislative Building? What happens in the Legislative Building? You might know that the first 10 amendments (changes) to the Constitution of the United States are called the Bill of Rights. What does this mean? What rights do we have? And why didn’t they put these rights in the Constitution in the beginning? The Constitution is very basic, but it includes instructions for making changes to it. The people who wrote it understood that Americans might need to add or change things later, so they created the legal process for these changes. The states approved the Constitution, but a lot of people were still confused about what the law said. They needed to know exactly what they could do and what they could not do. They also wanted to know what the government could and could not do. 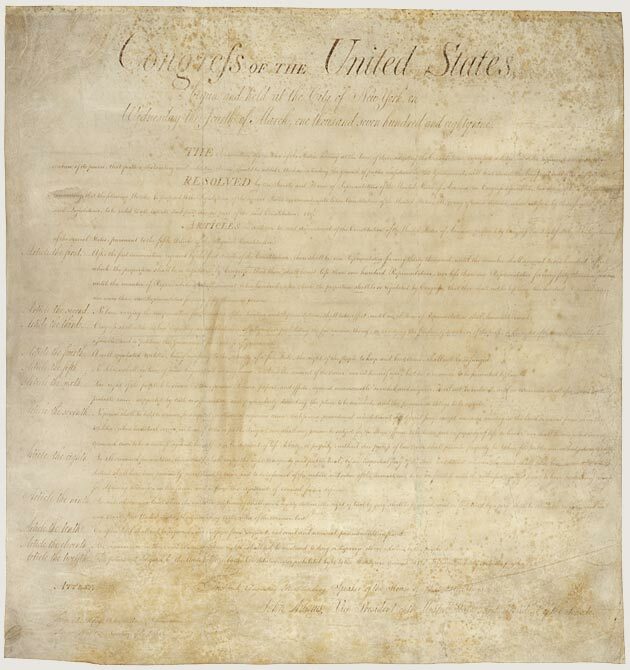 The Bill of Rights was written in 1791 to clarify (make more clear) the rights, powers and limitations of the people, the states and the federal government of the United States. What rights are described in the Bill of Rights? The First Amendment says that the people of the United States have freedom of religion, speech, the press (journalists/news people), peaceful assembly and petition of the government. That means that if I don’t like the government, I can say that I don’t like the government. I can call or write letters to my Congressmen to complain or ask for changes, or I can go with a group to Washington, D.C. to say that we are unhappy about something. I can also practice any religion I want or no religion at all. The Second Amendment allows us to own guns. However, each state has its own, more specific rules. The Third Amendment says that the government cannot require people to let soldiers live in their private homes during a time of peace. The Fourth Amendment says that the police cannot search your home, take anything from you, or arrest you without a VERY good reason. They must have a warrant (an order from a judge) or probable cause. Probable cause means that they have an excellent reason to think you have done something illegal. The Fifth Amendment explains the correct ways to do things in court. This amendment also says that the government cannot take your private property. If they want it, they have to pay you a good price for it. The Sixth Amendment gives more rules about trials in court. It says you have the right to a speedy (fast) trial by an impartial (fair) jury in the district (city or county) where the crime was committed. It also says that if you are arrested and on trial, you have the right to know what police believe you did, you have the right to a lawyer, and you have the right to witnesses both against you and in your favor. That means they will talk to people who say you did something illegal AND people who say you didn’t do anything wrong. The Seventh Amendment provides for a trial by jury in civil cases. If you do something illegal and get arrested, you may have a criminal trial. In a civil case, nobody gets arrested. Usually, civil cases are disagreements between two people (or companies). For example, if you have a contract with a company, and you pay the company for some work, but the company does not do its job, you can go to court in a civil case to try to get your money back. The Seventh Amendment says that a jury can decide who is right and who is wrong in this kind of case. The Eighth Amendment protects against cruel and unusual punishment and excessive fines and bail. This means that if you do something illegal, your punishment must be equal to your crime. For example, you cannot go to jail for 30 years because you stole something small from Target. The Ninth Amendment just says that the Bill of Rights is not a complete list, and that any rights not included should not be denied. The Tenth Amendment says that if the Constitution and the Bill of Rights don’t say anything about a right, each state can decide its own rules. For example, there is nothing in the Constitution or the Bill of Rights about driving laws, so each state has its own rules about how old you must be to get a license, how often you must get your car inspected, etc. 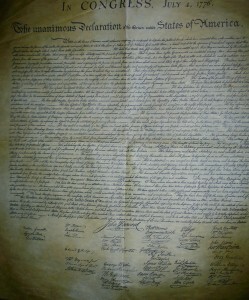 For more information about the Bill of Rights, check out this site. Then, for fun, print and complete this crossword puzzle about the First Amendment! With a partner, practice asking and answering these questions about the United States. For each one, “Q” means question, and “A” means answer. Take turns asking and answering the questions. 1. Q: How many states are in the United States? A: There are fifty states. 2. Q: Who is the president of the United States? A: Barack Obama is the president of the United States. 3. Q: Who was the first president of the United States? A: George Washington was the first president of the United States. 4. Q: What ocean is on the west coast of the United States? A: The Pacific Ocean is on the west coast of the United States. 5. Q: What ocean is on the east coast of the United States? A: The Atlantic Ocean is on the east coast of the United States. 6. Q: What is the capital of the United States? A: Washington, D.C. is the capital of the United States. 7. Q: How many stars are there on the American flag? A: There are fifty stars on the American flag. 8. Q: How many stripes are there on the American flag? A: There are thirteen stripes on the American flag. 9. Q: When do we celebrate Independence Day in the United States? 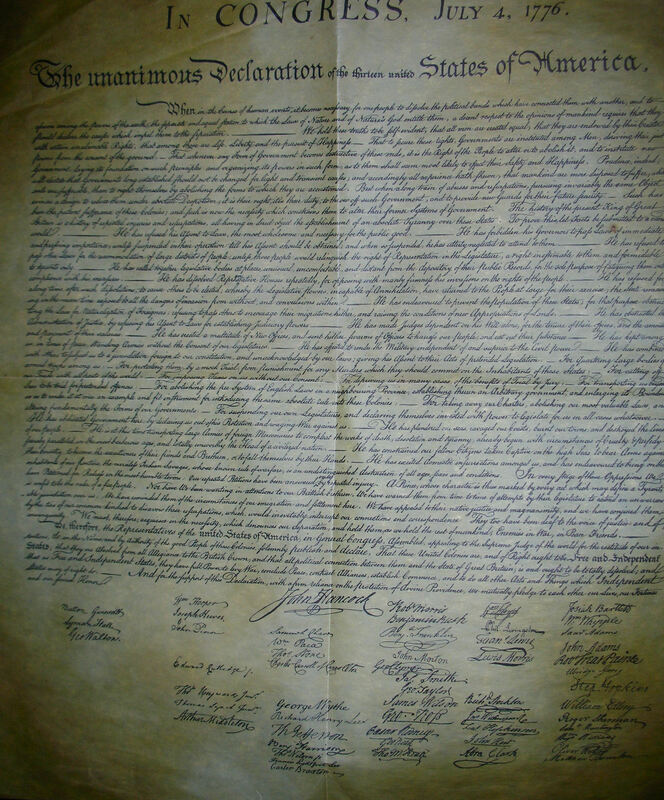 A: We celebrate Independence Day in the United States on July 4th. 10. Q: What is the name of the national anthem? Now, work with your partner to write 5 more questions and answers about the United States. Use complete sentences in your answers. If you were born in the United States, then you are an American citizen for sure, but are you a Native American? You might be a native American, but not a Native American. Do you see the difference? A native American (small “n” on native) is anyone who was born in the United States. A Native American (capital “N” on Native) is a member of a small group of people who have lived in the United States for thousands of years. Native Americans – or Native American Indians – lived here long before people arrived from Europe. When Christopher Columbus arrived in the Americas, he thought he was in India. For that reason, he called the people here “Indians.” We still use the word Indians when we talk about Native Americans. You can call them Indians, Native Americans, or Native American Indians. There are more than 500 different Native American tribes in the United States. A tribe is a group that probably has the same language, ancestors, customs, beliefs, and leaders. They may also live in the same area and work together like a large family. There are over 300 Indian reservations in the United States. 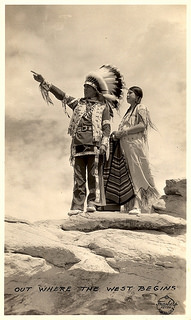 A reservation is an area of land managed by Native Americans. A reservation might have different laws from the area around it. For example, casinos (places for gambling, like the ones in Las Vegas) are illegal in North Carolina. However, the Cherokee reservation in western NC has a casino. When the Europeans arrived, they brought foreign diseases with them. These diseases killed many Native Americans. In 1838, the U.S. government forced millions of Native Americans to leave their homelands and travel west. They did this because the government wanted to use the land near the east coast for its own purposes. This migration of the Indians is called the “Trail of Tears” because it was a very sad journey for them, and many died. Even though Native Americans were here long before the United States became a country, they did not become U.S. citizens until 1924. What did you learn today about Native Americans? What would you like to know about them? Search the internet for more information, and share it with us in the comments! You’ve probably seen signs everywhere – in yards, outside of stores, beside the street – with names of people on them. They are many different colors and have many different names. Why are these signs everywhere? These are campaign signs (signs of people who want you to vote for them). They are everywhere right now because this Tuesday is Election Day. Election Day is on the first Tuesday of November each year. Why do we have Election Day every year? You may know that we vote for a new president every 4 years. In North Carolina, we vote for the governor at the same time. However, other offices have longer or shorter terms (lengths of time one person can have that office/job). Senators, for example, can stay in their position for 6 years before they must run for re-election (try to get people to vote for them again). Representatives run for re-election every 2 years. We have an Election Day every year because there’s always something or someone to vote for. Even if we do not need a new president, governor, mayor, or congressman, we sometimes need to vote about local or state laws. What are people voting about this year? This year, North Carolinians are voting for senators, representatives, and several judges. In Wake County, we are also voting for some local officials, including a sheriff. Voting is a right of United States citizens only. If you become a citizen, then you will be able to vote. Where do people go to vote? Each person votes in a place near his/her house. The place where you go to vote is called your polling place. If you move to a new house, your polling place will also probably change. 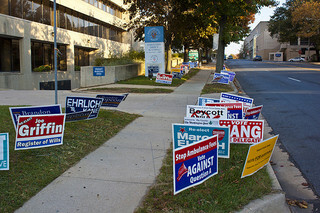 If you see a polling place on Tuesday, you will know because there will be many people there and MANY campaign signs. It created our system of government. The Legislative Branch of the government is the Congress, which has two parts – the Senate and the House of Representatives. The people in the Senate are called senators. Each state has two senators who represent that state in the federal government. The people in the House of Representatives are called state representatives, delegates, or congressmen/congresswomen. The number of representatives for a state depends on the number of people living in that state. North Carolina has 13 delegates who represent the state in the House of Representatives. The Congress is responsible for making new laws. The Judicial Branch of the government is the Supreme Court and other federal courts. There are nine judges in the Supreme Court, and their job is to decide what is legal (allowed, permitted) and illegal (not allowed, not permitted) based on the Constitution. Other parts of the Constitution explain how decisions are made in the government and the rights and responsibilities of the states. It has been changed 27 times. Over the last 227 years, 27 amendments (changes) have been added to the Constitution. These amendments give people more rights, take some rights away, or make rights more clear. The first 10 amendments to the Constitution are called the Bill of Rights. These amendments tell us about the rights of all Americans. Other amendments give people the right to vote. Men, women, African Americans, and people under the age of 21 all got the right to vote at different times. In 1917, an amendment to the Constitution made alcohol illegal in the United States, but in 1933, a new amendment made alcohol legal again. More than 11,000 amendments have been suggested, but only 27 have been approved by Congress. You need to know about the Constitution if you want to become a U.S. Citizen. What does the Constitution do? The idea of self-government is in the first three words of the Constitution. What are these words? If you don’t know all the answers, watch these videos to find out.